If you grew up outside of Alaska, you may have some memories as a child in art class when your teacher taught you how to make a totem pole out of an oatmeal canister, brown craft paper, paint and glue. It was fun, sure, but how much do you really remember about the totem pole and its cultural significance to many indigenous groups? Look no further – here are eight facts about the totem pole. Totem poles from Alaska are carved from cedar, which is rot-resistant and grows in the rainforests (yes, rainforests) in Southeast Alaska. The totem pole originated in the Pacific Northwest and Southeast Alaska. 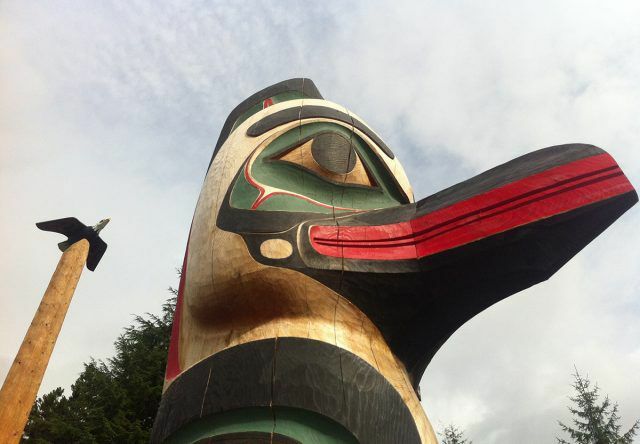 Totem poles are carved to display characters and ancient stories, which is why totem carvings often include fish, eagles, bears, ravens, human faces and even supernatural figures. Historically, totem poles were never fully painted. However, when something was to be painted, a mixture of chewed cedar bark and salmon eggs was used, along with certain powders for pigment, as a type of oil-based paint. Contrary to what the first European explorers thought, totem poles were never objects of worship, but rather were illustrations of important family or cultural stories. Some of the greatest concentrations of currently standing totem poles are in Sitka and Ketchikan, Alaska, and can be easily seen at the Sitka National Historical Park and Ketchikan’s Totem Heritage Center and Totem Bight State Historical Park. One of the tallest totem poles in the world can be found in Kake, Alaska, standing at 132 feet tall. One of the most famous living totem pole artists is Tlingit Nathan Jackson. Since 1975, he has carved more than 47 totem poles over 10 feet long. See current specials at Westmark Hotels.